Busy day for Unison branch! 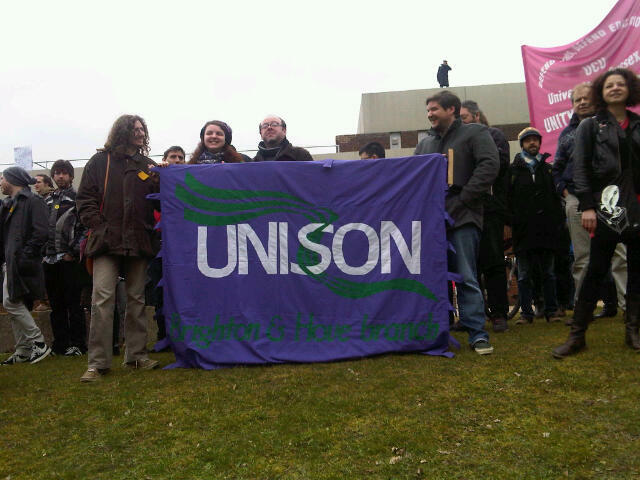 The Brighton & Hove Local Government Unison branch banner had two outings on 28th February. Firstly it was unfurled at the demo of Sussex University students, currently occupying university buildings in protest at plans to privatise services on campus. Unison supports the students’ action. Next it appeared at the lobby of the city council’s budget-setting meeting at Brighton Town Hall. Councillors were set to vote on a new package of cuts – £17 million more of lost services and jobs. Want to join the fightback against these attacks on ordinary people while the rich get richer? Join your union at work if you can, or come along to the Stop the Cuts Coalition events in the city. Go to the Contact Us section of this website and send us a message, and we’ll get back to you with more details.